A fun way to get to know your members is to play a Japanese game called Sugoroku. 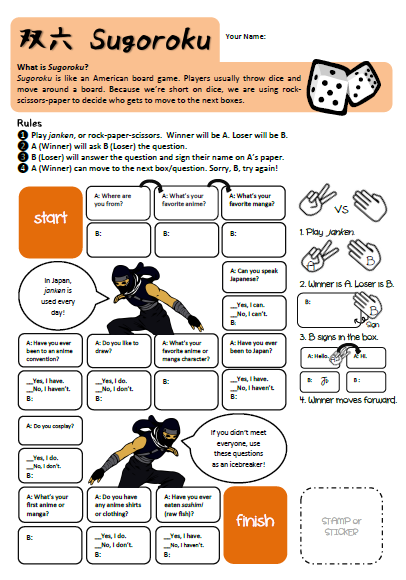 We also included the Japanese version of rock-scissors-paper, janken, so your anime club members don’t scramble around looking for their dice. Sugoroku, which translates to “child’s dice game” or “Japanese backgammon”, is a game similar to American board games. Players usually throw dice and move around a board. Because we’re short on dice, we are using janken or rock-scissors-paper to decide who gets to move to the next boxes. ❶ Play janken, or rock-paper-scissors. Winner will be A. Loser will be B. ❷ A (Winner) will ask B (Loser) the question. ❸ B (Loser) will answer the question and sign their name on A’s paper. ❹ A (Winner) can move to the next box/question. Sorry, B, try again! There are 2 formats available for this game. Categories: Downloads, Ideas | Tags: anime club, anime club idea, game idea, janken, japanese backgammon, rock paper scissors, sugoroku, worksheet | Permalink. Anime Ascendant is a website designed to assist secondary school, university, and community anime, manga, and Japanese culture clubs. Anime Ascendant offers support for these clubs in the form of advice, links, forms, contests, and programs. Get club advise! Please message or call Skype handle jeridel.banks for immediate advice. How Do I Keep My Anime Club From Falling Apart? Poll: What Does An Anime Club Leader Need The Most? Anime Ascendant is on BlogLovin'!